That's because when a big PC game comes along that's considered a generational leap, PC owners can, en masse, feel the need to go out and buy new hardware for their rigs. And Battlefield 3 is, for many, that game. Jon Peddie Research's Ted Pollak has told IGN, "Modern Warfare 3 and Battlefield 3 will help sales of Xbox 360s and PS3s." "More importantly, and rarely covered by the press, Battlefield 3 is driving upwards of a billion dollars in PC builds and upgrades this year alone. No other title since Crytek's Crysis had such an anticipatory impact on PC hardware sales." While I think Skyrim is contributing its fair share to this guesstimate, he does have a point. 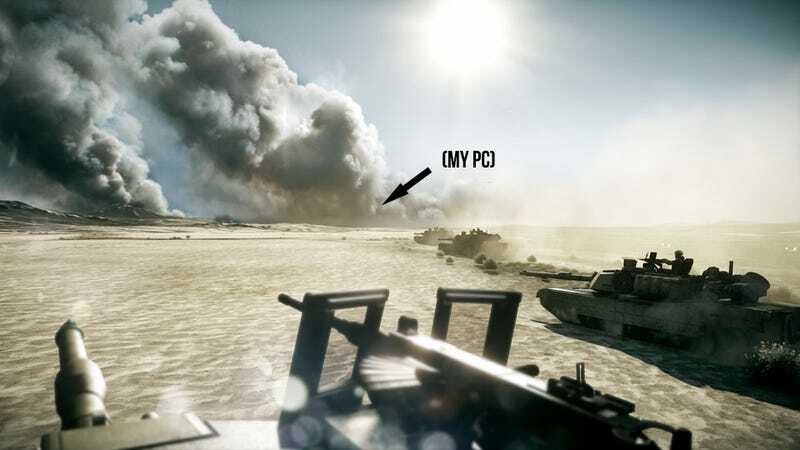 There's an excitement in the air for Battlefield 3 from PC gamers that hasn't been seen for years, an almost unanimous feeling that, yes, a game is coming unlike any other we have seen before, and we need new gear for our PCs to get the most out of it. Add up hundreds of thousands of PC gamers across the world spending anywhere between $150-$1000 on everything from new graphics cards to an all-new system and, yeah, you can see where the "billion dollar" estimate comes from. Let's just hope after all that money spent on making it look good, what we're actually playing is worth all that cash!